I've not done a Trendy Tot Thursday link up for a while so I thought I'd do a triple whammy of outfits! 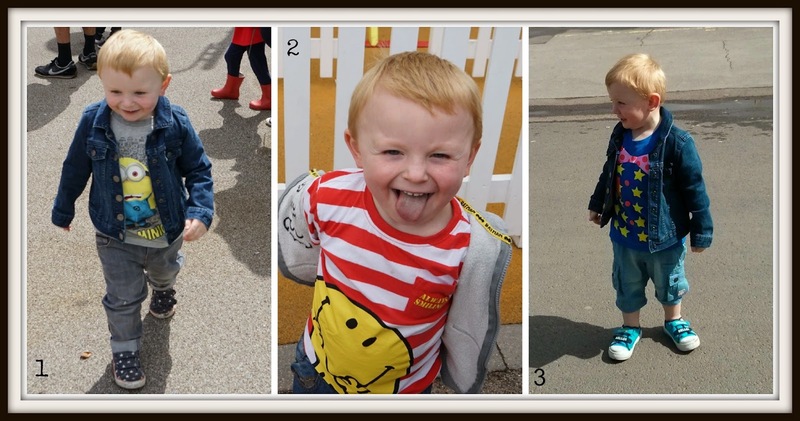 We were away on holiday at Butlins last week so Elliot had some new t-shirts to wear, I think he looks very smart! The denim jacket has featured several times on the blog but I do love it, it's perfect for this time of year when it's not quite cold enough for a coat but you just want something lightweight to put on. And it fits Elliot much better now than when my mum first bought it for him last Autumn! Elliot's Mr Tumble t-shirt has attracted so many nice comments and it has been well worn since we bought it last month at the live show. We almost didn't buy it (it was a bit expensive!) but really glad we did, he loves wearing it and I think the colour really suits him. He had at least 3 children shout "Mr Tumble!" at him last week! Great clothing choices! I love supermarkets for kids clothing!